We usually stick to truly original songs about dogs here at Dog Song Saturday at Talking Dogs. However, sometimes we run across a music video that we simply can't resist sharing. Today is one of those days. Listen to the lyrics of I've Loved You All Over the World by Willie Nelson and we're pretty sure you'll agree it is pretty perfect for this video celebrating a 14 year old dog's birthday. The dog and his bestie are fulfilling a bucket list during a weekend trip of a lifetime. The bond between a man and his dog is as strong as the Subaru Impreza according to the video. In his furry best friend's golden years, the pair finish the dog's bucket list: filling shopping carts up with tennis balls, 14 and 3/4 birthday cakes, a brand new leather shoe to chew on and fixing mends with old girlfriends and more. 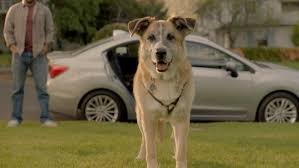 Yes, it is a commerical for Subaru - the folks who've brought us some barking good dog / auto advertisements over the years. No, we don't drive a Subaru and this is not a sponsored blog post, nor are we urging you to shop Subaru. We just happen to love this company's ads. Sit. Stay. Relax and enjoy Dream Weekend and the I've Loved You All Over the World by Willie Nelson soundtrack. Fetch more dog songs and music videos at Talking Dogs. You'll be surprised at how many we've collected over the years. Wow 14 years old, just wonderful!